Little is known about the history of Brazil before 1500. When the Portuguese arrived in 1500, the Brazilian population consisted of over 5 million indigenous people. When their numbers began depleting, the Portuguese started shipping slaves from Africa in the mid-16th century. Over the centuries, Brazil’s peoples were diversified further by several waves of immigration from the Middle East, Asia and Europe. 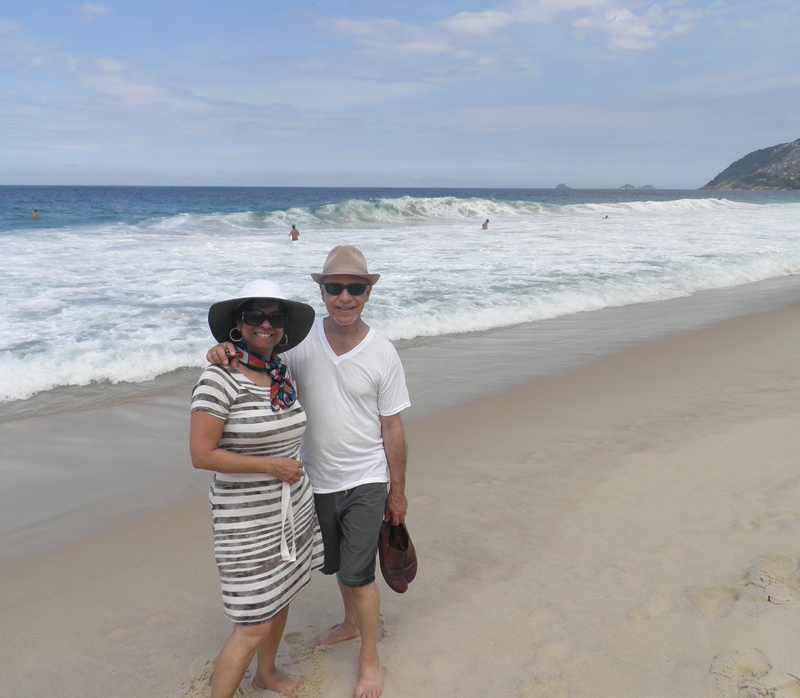 When Debra and Bruno invited us to Brazil, there was no hesitation on our part to accept, and before you know it, I was happily making reservations, researching places, getting visas processed and getting ready for a trip of a lifetime. And so our journey begins… The 10 hour flight from JFK to Sao Paulo is not as bad as I had anticipated. I pass the time watching movies, reading, knitting, playing games and watching the map in the seat in front of me. The descent into Sao Paulo is breathtaking: mountain ranges all around, and then the city of Sao Paulo appears out of the clouds. We notice the temperature change almost right away. We had experienced probably one of the worst winters on the East Coast of the USA, so this is a welcome change from the frigid temperatures we’ve left behind. We drive through hilly terrain all the way. 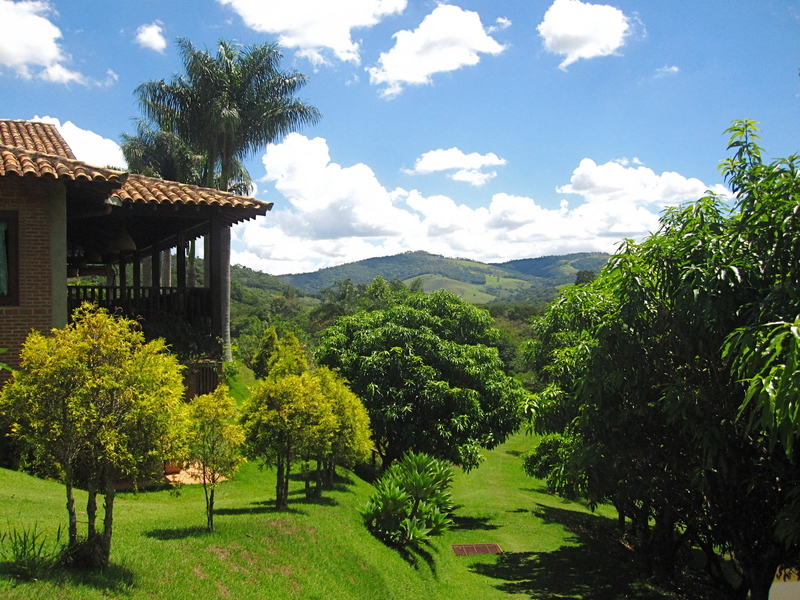 Debra has arranged for her family and us to spend a few days in the beautiful region of Monte Alegre do Sul, about two and a half hours north of Sao Paulo. It is lush and bursting with tropical flora – it is here we luxuriate for the next 4 days. 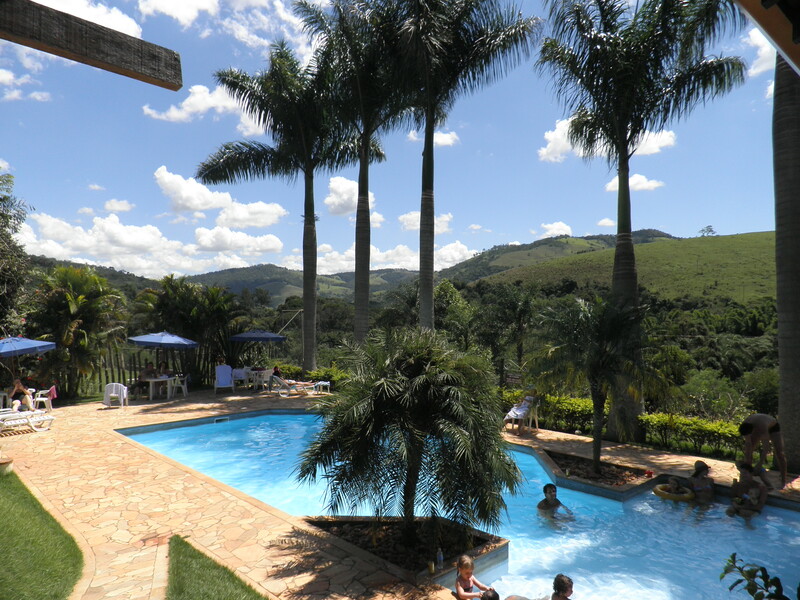 We each have our own chalet and immediately strip from our winter clothes and in search of a cool Brazilian beer. There is an array of home-style dishes to choose from in the resort’s dining room, served 3 times a day. There is the famous feijoada (black beans and rice, with a spicy sausage). The dessert table always featured flan, various stewed fruits, cakes and other puddings. Brazilians are warm and affectionate. It is not uncommon for someone to embrace you when meeting for the first time. This is pretty evident during our time in this rustic paradise. It is great to re-acquaint with Debra and her family again, and of course meeting her 18 month old son Fernando for the first time. We exchange stories and laze around the pool and verandahs. 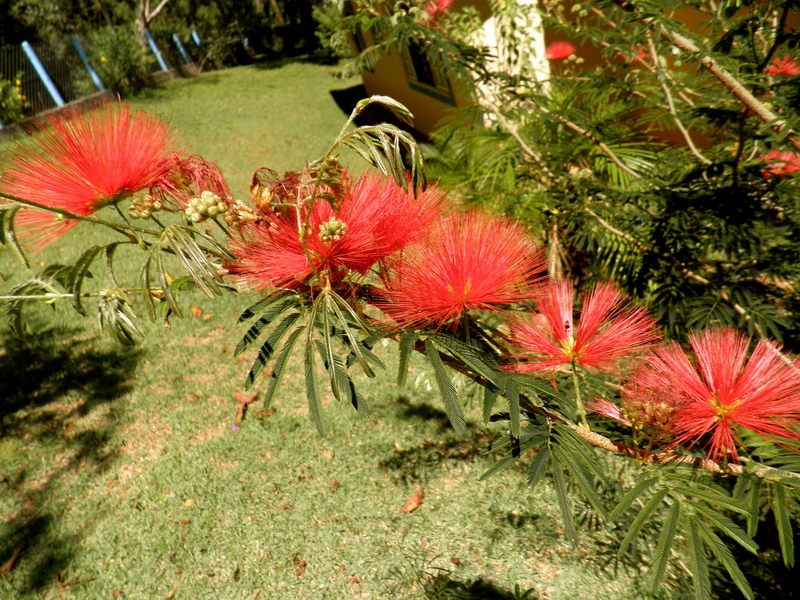 Birds of Paradise, banana trees, hibiscus and palm trees surround this well laid out facility. At the bottom of the property runs a deep brown, turgid river due to the long drought it has suffered this season. Marmosets climb from one branch to the next. They have a monkey-like face and a striped tail like that of a raccoon. One of the waitresses insists that I try a caipirinha, a famous Brazilian drink made of sugarcane liquor. Passion fruit, papayas, mangoes and melons grace the breakfast table every morning. 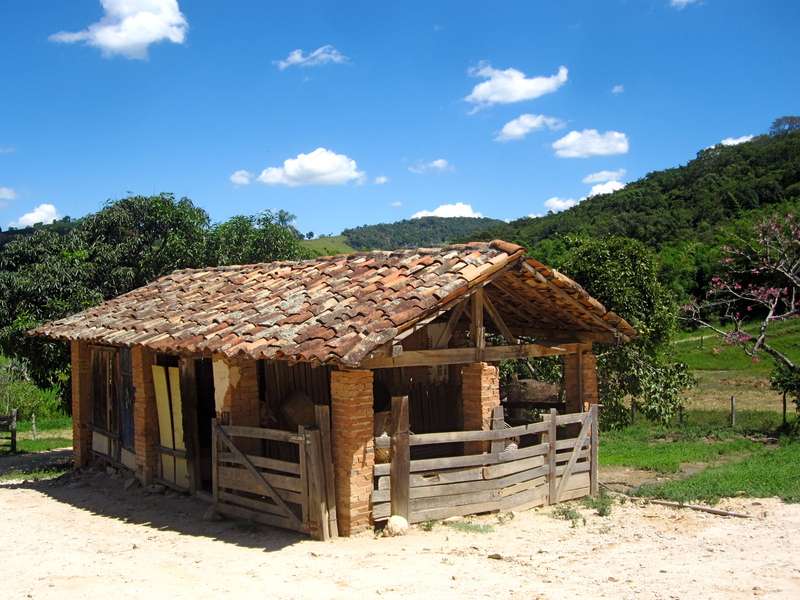 Four days into our trip and we are still in the countryside of SE Brazil, far from the hustle and bustle. 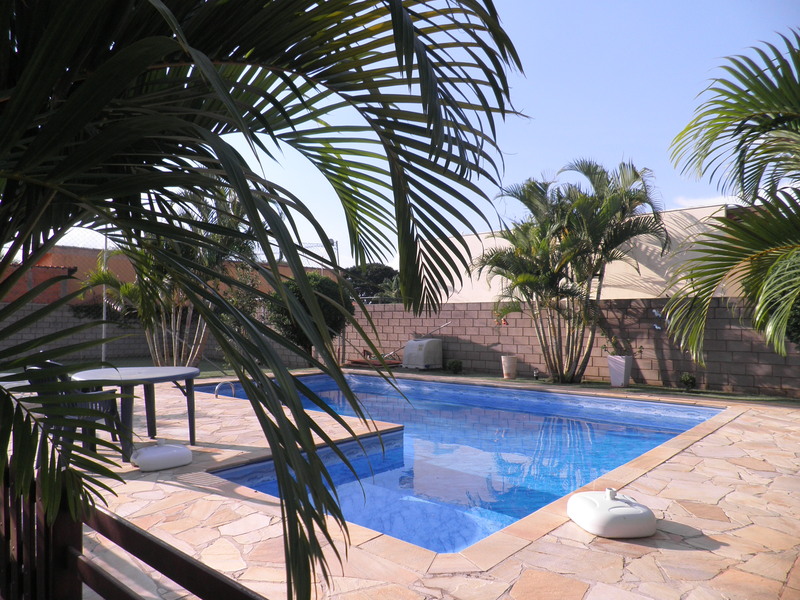 We head over to Campinas, north west of Sao Paulo – the home of Debra and Bruno’s. They have a beautiful home with a 4-a-side soccer field in the backyard, a pool, an outdoor kitchen, and a wrap-around verandah with hammocks to laze in. The sun bakes the red earth as we sit in the verandah enjoying a nice cool coconut water drink. The doors and windows are wide open and gentle breezes cool the inside. Palm trees, banana and lemon trees grow in the garden. All around us, I notice the terra cotta roof tops. 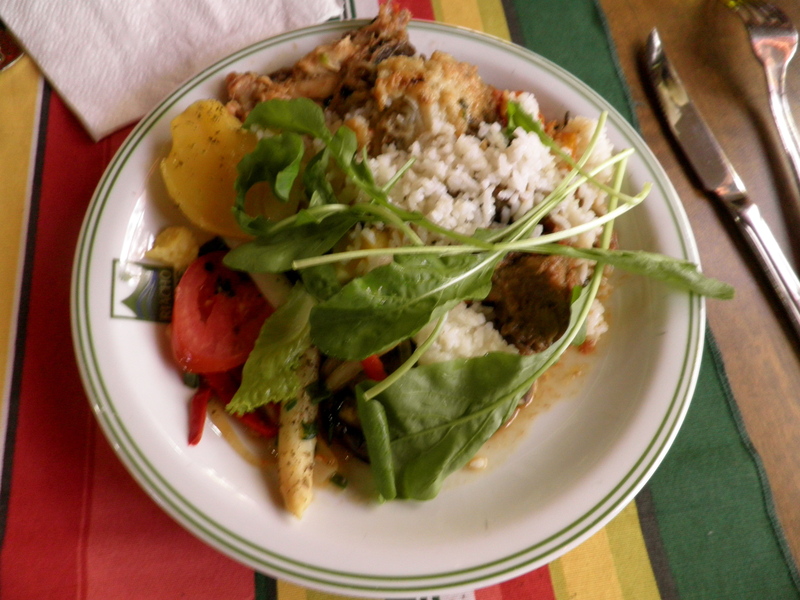 We eat a heart-warming lunch prepared by Debra’s cook outside on the verandah. There’s rice and beans, shredded beef cooked in a pressure cooker, arugula salad, sauteed zucchini, and a carrot cake drizzled with chocolate sauce. En route to Rio, miles of sugarcane and termite mounds dot the landscape. 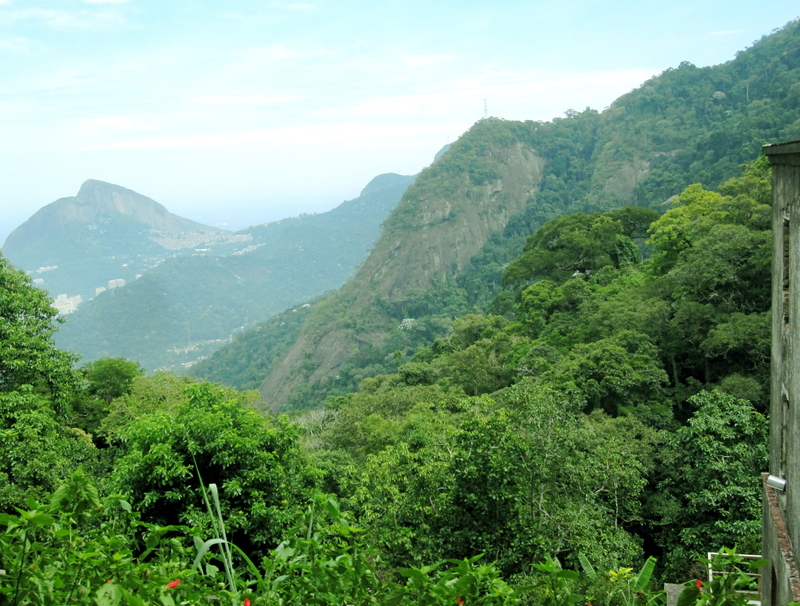 Hills and mountains surround us as we navigate our way to the city of Rio de Janeiro (River of January). As we approach the city, I can’t help but notice the infamous favelas (slums or shantytowns) on the outskirts of the city. I had read about these favelas in Rio and Sao Paulo, and immediately became intrigued by them. I couldn’t help but wonder why these favelas had the best views perched on mountain tops and later found out that the more affluent folks live by the water. Shouldn’t it be the other way around? Favelas – A favela is a term for “slum” in Brazil, most often found in urban areas. The first favelas appeared in the late 19th century. This was the place where former slaves with no land ownership and no options for work lived. Over the years, many former black slaves moved in. Today these areas are frequently crime-ridden and have long been dominated by gangs immersed in illegal drug-trafficking. Police presence is sporadic, they are afraid of going into the favelas. With the upcoming World Cup in Brazil, the authorities are poised to send the army into the slums of Rio. 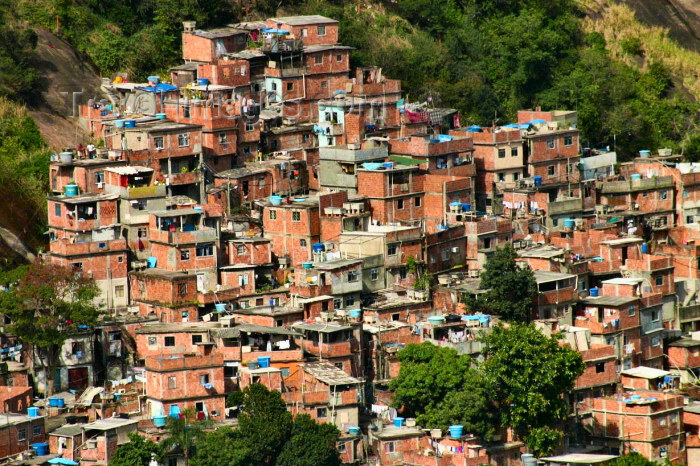 Read more about favelas here . Futebol fever, and the excitement is building in all of Brazil and around the world for 2014 World Cup. I took this picture from the top of the mountain using my zoom lens. 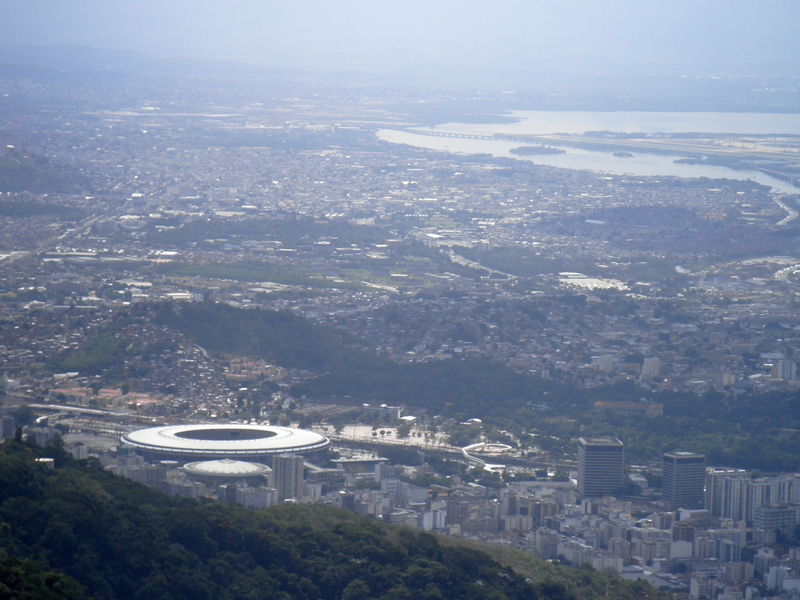 The Maracanã stadium (pictured above) is scheduled to host a total of seven matches, including one quarter-final and the final. Listen to this clip from National Public Radio. 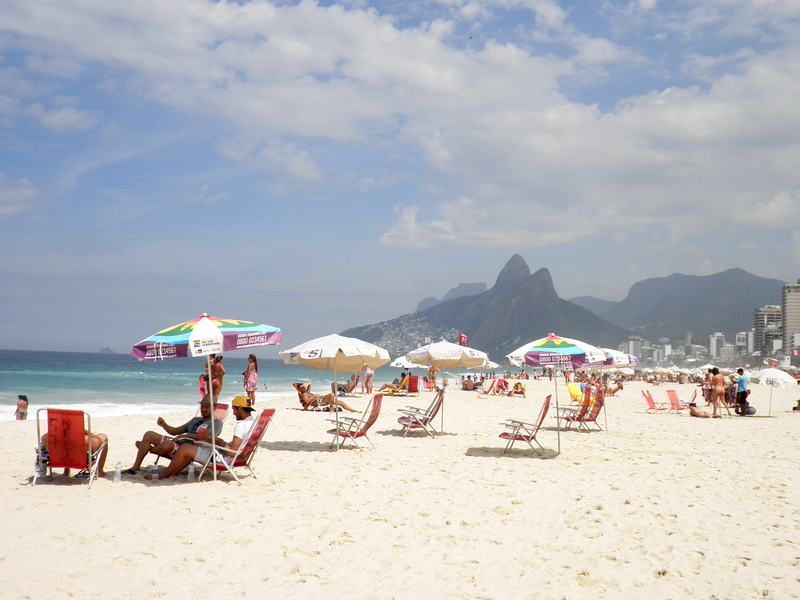 Debra had rented a 3-bedroom apartment close to Ipanema Beach. We settle in, and take a stroll at night to get a feel for the city. We immediately notice the well-dressed, folks out for the night in search of many of the outdoor restaurants. 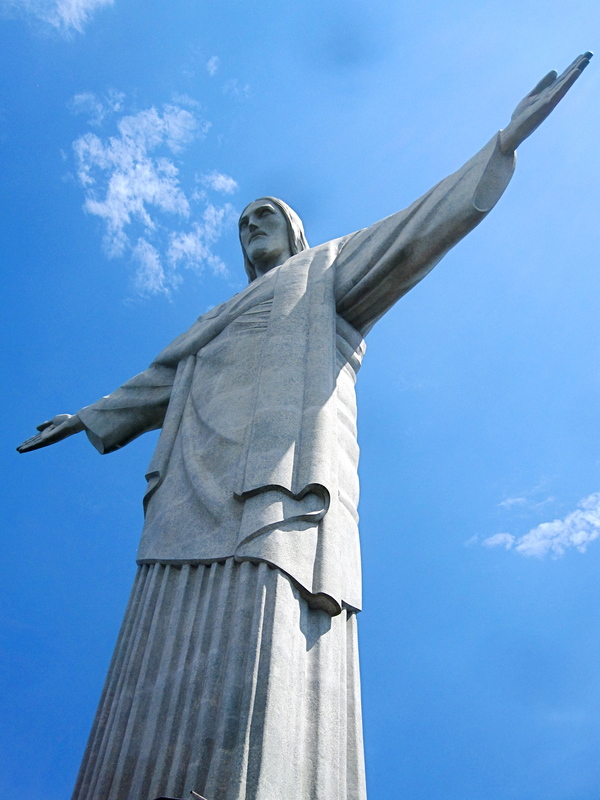 The next day we plan to visit Cristo Redentor (Christ the Reedemer). 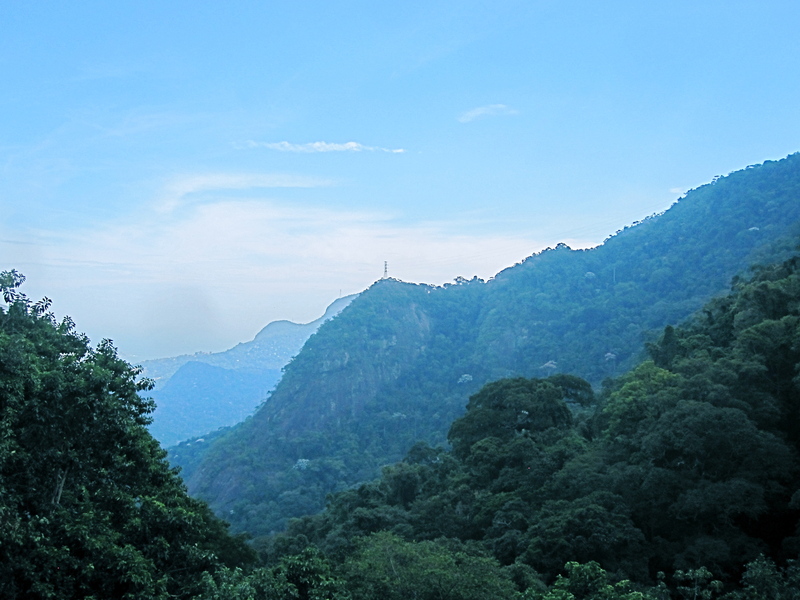 We hop on the 15-minute tram ride to the top of Corcovado Mountain which is 700 meters high. The scenery is spectacular offering sweeping views of the city, beaches and mountains. The heat is intense, we’ve had a full day and we retire to the apartment after a very tiring day. That night Bert and I take a late night stroll on Ipanema Beach, find a small shack on the beach, order a beer and listen to the waves lap the shore. We spend most of the next morning walking along the water’s edge, take in the sunshine, the sights, sounds and smells of the beach, and what an amazing view!! The city, the mountains and the beach, surround us. Goodbye Beautiful Brazil, we’ll surely return someday! What a wonderful travel blog to start your new adventure. The pictures are gorgeous and the description of the places you visited very interesting. It brought back memories of a trip we took down ther a few years ago. Thanks Irene, it took a few weeks to get it together, and now hoping to get inspired with a new topic soon. I loved this adventure through your eyes and lens of the camera! Tremendous photos!! I like the way it felt as though I were traveling with you. Keep taking safaris and I’ll keep reading and traveling in MY mind with you! ..yes Brazil is indeed lovely!!! Thanks Maria, it encourages me to hear positive comments, but I’m also open to hearing how I can improve the site. Thank you too Selma, it looks like we share more in common than we know. I too grew up in Kenya, England and Canada, but now live in the USA. I’m thrilled at the thought of sitting in my armchair, penning these thoughts in front of my computer and having the world at my fingertips. It is so refreshing to compare notes from folks around the world. Thank you. Blogging is my new best friend! Lovely to read your perspective. Congratulations on getting started with blogging and will look forward to updates. Cheers! Many thanks Neel – it seems I’m off to a good start so hopefully will post again in the not too distant. Loretta, what a great story. I am ready to pack my bags and head for Rio! So happy that you stopped by Food on Fifth and to have found your great blog. See you soon. 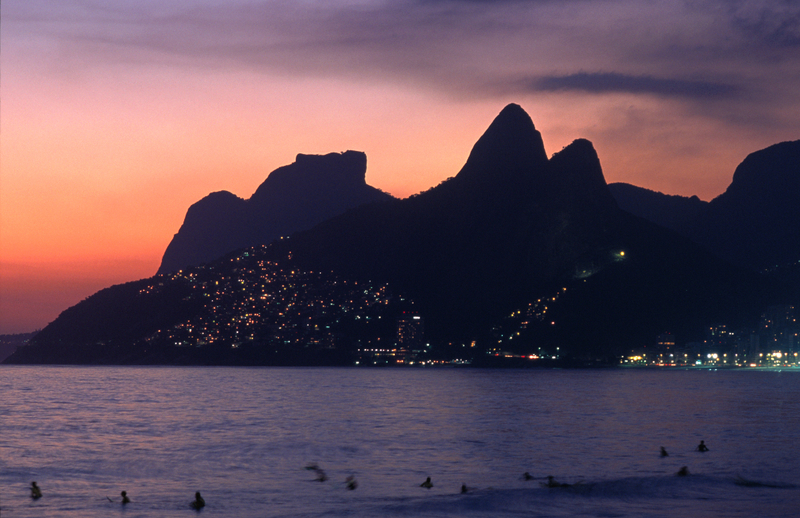 wonderful photo essay of your journey–I would love to visit Brazil someday. Nancy, thanks so much for visiting Safari of the Mind. Love the title of your blog too and hope to explore and find my way around your site. Like you, I love good food too, and hope to put out some posts on exactly that. Thanks again. you are an excellent writer Loretta! very professional job with the photos too. I imagine you will have fun as a food stylist too on your next “safari” kudos to you! Thank you kindly Susan. Yes, watch this space for the next safari :). Thank you kindly eclecticoddsnsods :). I’m assuming by your name, you have to be from the Green Isles :). Love it :). Thanks for your kind comments. The favelas continue to deteriorate we’re told, and now with the upcoming World Cup, everything has spiraled out of control. It’s such a shame, Brazil and it’s people are fabulous! Thanks for stopping by, I’m realtively new to the great world of blogging, but I’m getting excited about the possibilities. I’ve added you and hope to exchange. Absolutely breathtaking. Love your blog!!!! Dear Fellow Bloggers and Readers, I had taken a bit of a hiatus from the blogging world for the past couple of weeks as we lost my mother in law in Canada. It was an upsetting time for all and I was consumed with a whole range of emotions both mentally and physically. My next post will be dedicated to her. 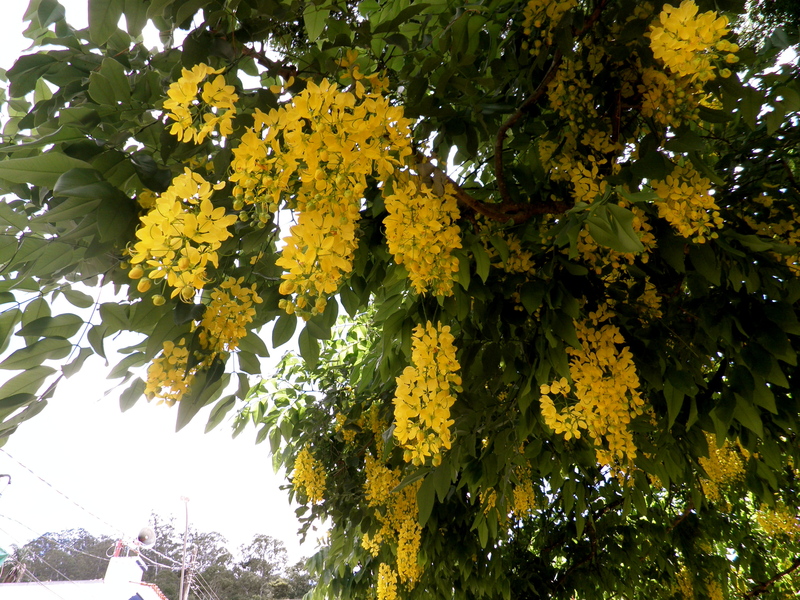 Today, I’d like to re-blog this post on Brazil. It was exactly a year ago last March that we took this trip. I had been thinking of blogging, writing a journal, cataloging my travel adventures, and Safari of the Mind was born. 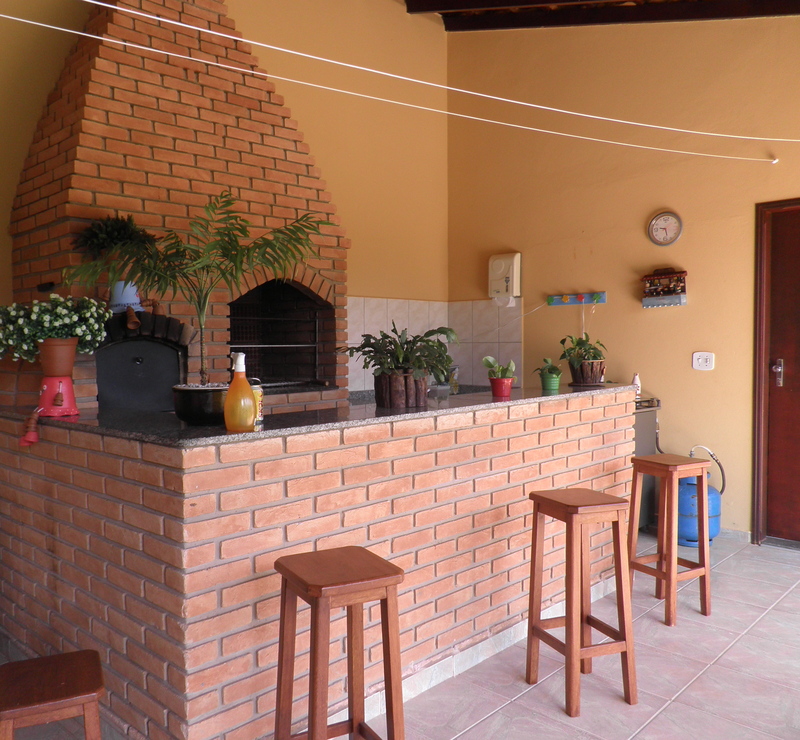 I also wanted to showcase some of my experiences in the kitchen, gardening and travel. At the time I was pretty proud of my first post, it took me almost a month to put together. My blogging experiences have exploded since then. I’ve met some amazing folks from around the world, I’ve learned new and innovative ways to present. I’ve taken online courses to improve the blog content and photography and I’ve interacted with some very special folks. I have a friend that lives in Brazil and is always encouraging us to visit. Your pictures are gorgeous. Thank you for covering so many aspects of this country. Oh you definitely should consider it Julie. It is so vast and varied, we will have to go back for another visit soon. What a wonderful trip! So sorry for your loss. I know how difficult the loss of a Mother is. I lost my Mother last June. It is understandable to take time from your blog or anything else that you’ve enjoyed. My blogging hiatus has been a very extended time due to how much the loss and grieving took over my life. I hope that you and your husband have been surrounded with family and friends to help you through the most difficult days and that you once again return to the joy that your blog can bring you. Sharing…is a healing thing! It is very hard to deal with the loss and I hope and wish that you and your husband are finding solace in cherished memories of your mother in law. I am glad you reblogged this- You have captured so many aspects of this beautiful country! 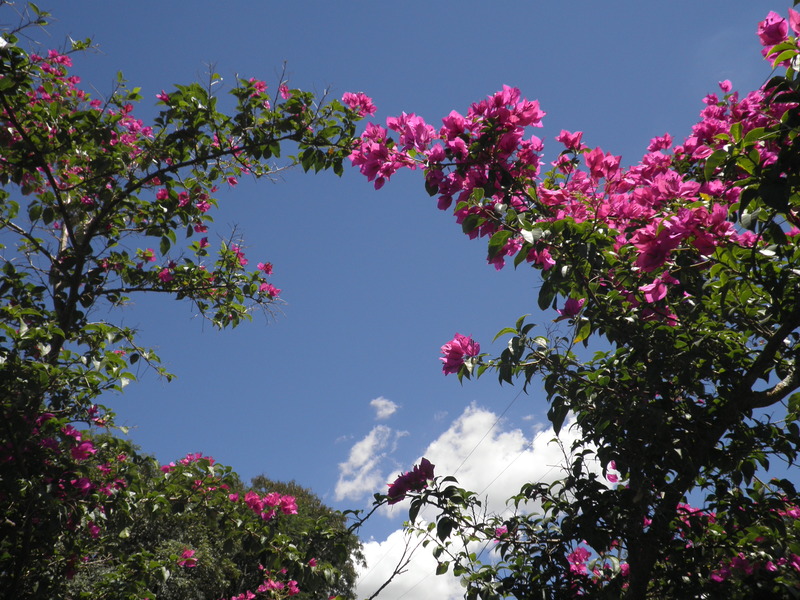 Beautiful pictures, Loretta – the bougainvillea is absolutely gorgeous! 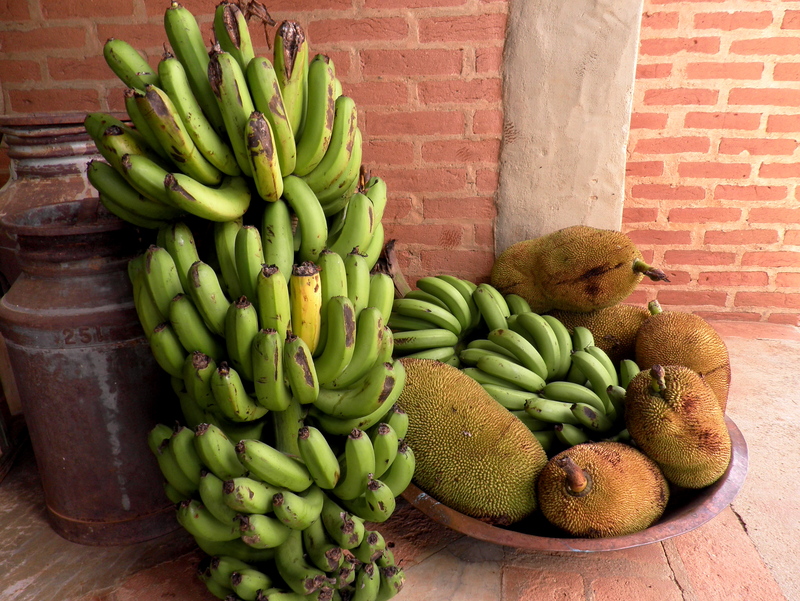 And as for those bananas … You were so lucky to spend some time inland, not just at the coast, to get to know the country. Thanks for pointing me to this post – it’s great to see how others look at things! So glad to tour Brazil through your eyes as well this morning Loretta! Stunning vistas and flora portrayed in your post. How fortunate you were to be invited to this spectacular country. 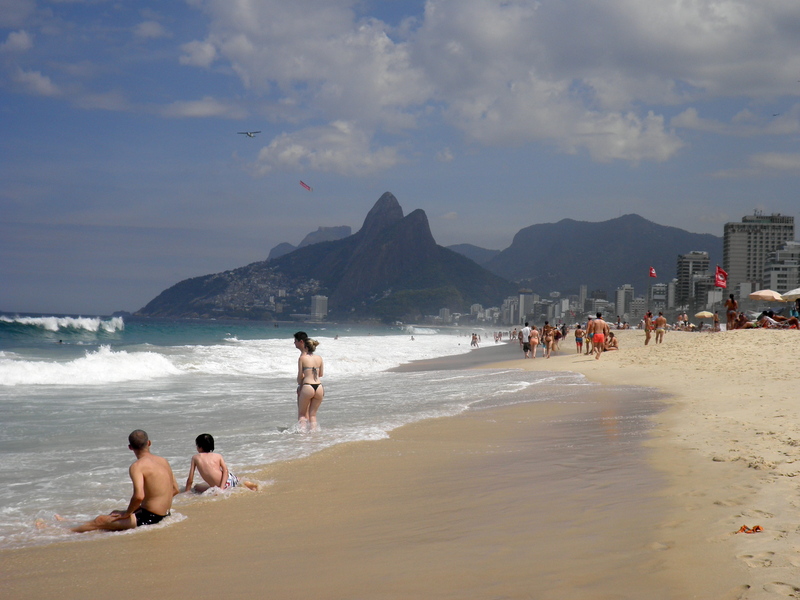 I was happy you started out inland as what I know of Brazil is mostly from the beach and urban areas. The faveola shot is arresting. It made me wonder how many people live in such a dense area. It reminded me of a recent book “Behind the Beautiful Forevers” on the slums of Mumbai. I was shocked when I did the math and figured out the population living in those conditions. Your photograph makes the slums look dignified and beautiful. Thanks so much Johanne. 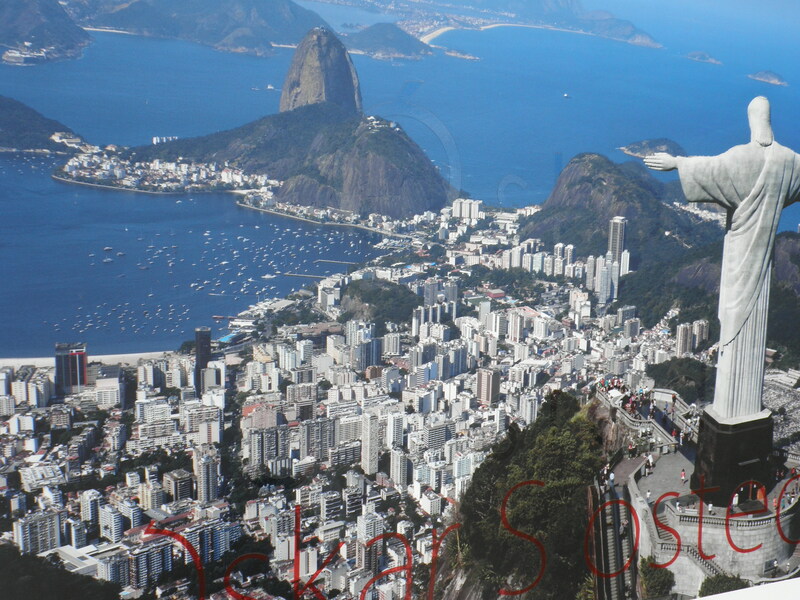 I thoroughly enjoyed writing the post on my return from Brazil about 2 years ago. Debra, like my husband is a Materials Engineer working in Sao Paulo for Dupont. Before she got married, she spent a full year here in Wilmington for work, and we practically adopted her. She’s about 2 years older than my oldest daughter. It was wonderful spending so much time with her and her family in Sao Paulo and Rio, we loved the itinerary she planned for us. She’s now married with two little boys. We’re really looking forward to her visit here in May when she will be in Wilmington again for 2 weeks attending a conference. Next PostNext COOKING UP A STORM!